at the Sierra mountains where, in June, the winter lingers. down the canyon’s lava wall to the stream below. And in those translucent moments, I often see all Paradise’s past as ghostly, drifting like a soft wall of mist across the scrim screen of Paradise present. I can always hold this phantasm at bay, filter it out to get the errands of the day done. And then in an unguarded moment, it returns. One afternoon soon after I arrived in Paradise I saw my father standing next to the Skyway. I saw my father, alive as you or me, and dead these forty years. By the time I saw him it didn’t really shock me. I’d lived in Paradise for over a month and I knew these things could happen here. Paradise was not just Paradise. It was a ghost town. And it was filled with my ghosts. I first saw my father in the middle of the day next to Big O Tires on the Skyway. I’d gone there to have some minor repair done to my car and, while they took the car into the bay behind me, I wandered into the empty front showroom and gazed through the Big O display windows looking out over the Skyway and down the steep decline and quick rise of Pearson Road. Then I glanced down to the left of the showroom at a small vacant building next door. It was caked with many years of paint. The latest coats were pale gray with a light blue trim. The windows were sheets of painted plywood nailed tight to the frames and the door was shut solid with a large padlock. It was shut tight and, like many buildings on the Skyway in Paradise and beyond, had a large red and white “For Lease” sign attached to the front. Then as I looked at it my father walked through the closed and padlocked door and, like me, stood looking down hill as the traffic paused at the light and then turned left or right at the T-junction. 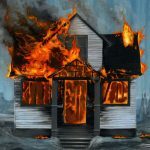 It was December for me, but it must have been summer for him because he stood there in his starched, short-sleeved, crisp and immaculate white shirt with a stainless steel Parker ballpoint pen in his pocket, a sharp crease in his slacks, his perfectly shined shoes, and a ruler-level flat-top — his choice of a “sharp” haircut for men and boys. He stood there for about a minute as I watched him without moving, the smell of new tires in my nostrils. Then he turned and walked back through the walls and into his office. Behind me a burst of compressed air from a lug wrench brought me out of my brown study and I was looking again at a ramshackle gray and blue building with a small courtyard that was now “For Lease.” It was then I recognized the old building as the place where my father had had his car dealership when we all lived in Paradise in the mid-1950s. I told myself that what I had just experienced was some sort of vivid memory from my childhood as a kind of faint film from my mind projected onto the mundane present. Yes, that was all it was. I’m sure of that. I’m an educated man of no little experience in the real, wide world of now. It only felt like seeing a ghost. In broad daylight in deep December, dressed for summer in his crisp white shirt. The last time I’d seen my father before this was in a dream decades after he died on the operating table. He came to me out of the streets in the Red City that persists off and on over the years in my dreams. He was wearing a hospital smock stained with large patches of his blood. He said to me, “I don’t belong with the dead,” and then he faded. I hadn’t seen him since. This time, on the Skyway of Paradise, he was looking much better; looking at home with the dead. This time he didn’t even seem dead, only translucent. I had a brief moment of disappointment that he was gone before we could continue the conversation from where he left off in my dream, but having been briefly dead I knew that the dead have little to say to the living. In any case, he was my father and I was, this time, glad to see him. These days I pass my father’s place on the Skyway several times a week while turning onto the Skyway on an errand in Paradise or down from the ridge and into the valley to see my mother or to get the kind of meal unavailable in Paradise. My father’s vacant office is right at the turn and, because of that (or so I tell myself), I don’t stop. Someday I might pull over down the road a bit and walk back to his office hoping to see him again. But I don’t think he’ll oblige if I do. He doesn’t have to. He’s not inside our time now. He’s just one of many ghosts that I’ve seen of late, up here on the ridge, up here in Paradise. Don’t know if you consider yourself lucky for seeing your Dad. I do, though. Never seen mine again. Fathers are crucial, as you so clearly explain. Sent small check and a couple of my go-to books. Holler if we can help you. As I read your essay on going back to your old home town, I thought about the last time we drove back to my childhood home. Apparently (seventy or eighty years ago) everyone in the family agreed to all move there and live within blocks of each other; since my grandparents were on White St. three blocks away and three other families or assorted aunts, uncles and cousins on the Danish side were within a five block circle. And one Irish family, my fathers brother, way out there at the ten block hinterlands. We came back so I could get some images of the old houses we had all lived in and some I could find and some I can not longer remember which house they were. My Grandfathers house I did find. Property values in Arlington are sky-high now, so everything is very well maintained. However the current owners have put a black driveway, two cars wide, over my Grandfathers vegetable garden. I wanted photos of the old life to show Mom of her childhood home, she was failing and passed on a week later. She looked, I don’t know if she saw. After reading what you wrote about Paradise, I tried to imagine what Arlington would be like reduced to ash. I couldn’t imagine it, I can’t see it. I can’t comprehend it. I hope the small package of books I entrusted to the USPS makes it to you safely. Be good. Whole lotta ghostin’ goin’ on lately ’round these parts. Born and spent the first 11 years of my life in rural Gettysburg, moved in ’66 and have never been back. Don’t really have a desire to. Spent the next 40 years in Cape Coral/Fort Myers, FL, moved here to the great white north in ’06. Don’t really have a desire to go back there neither. There’s other places to see. Back home. Now home’s burnt up. I hate those family dreams. Sometimes a nightmare, others just a visitation. So clear. So present. Maybe I don’t hate them. The memories of my own father are cherished and maybe any “visit” is worthwhile. Do you find you know deeper, but less, as you grow older? When you make your next (and possibly last) visit to Paradise, he may return and help you in what must finally be done. If you need (or want) any help with above, please let us know. We will be there. 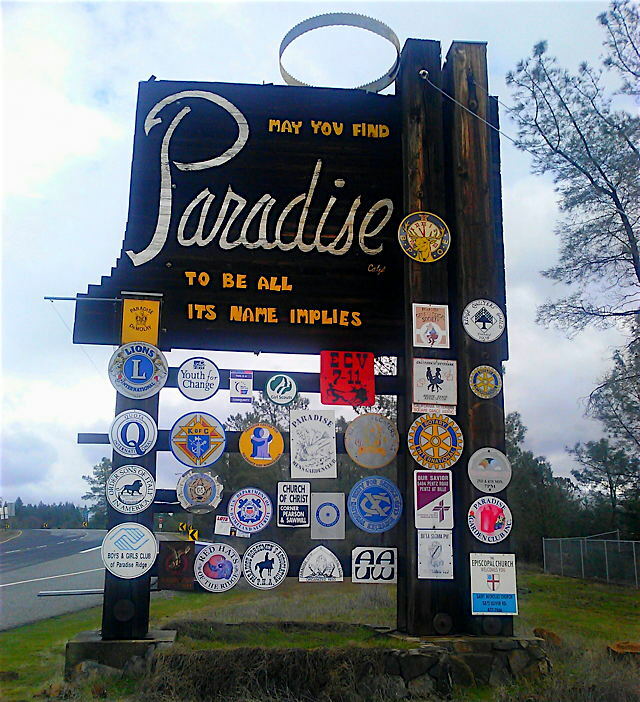 I notice in the photo above of the welcome sign to Paradise that a vacant space exists to the right of the Rotary Club plaque. In other photos that space is occupied by a Masonic emblem. Is/was there a Masonic lodge in the town? I do know that the Grand Lodge of California is soliciting members for relief in Paradise. There was a Masonic Lodge on Clark Road across from the Safeway center. The center’s gone and I’m pretty sure the Lodge is gone too. I don’t think it was an active lodge but it was rented out for various functions. The close of one chapter and the opening of another. I never saw my Dad in my old home town. But there are times when I miss him, and the place that I loved most in all the world, so much that I find the weight of the sadness makes it hard to breathe. The best remedy I have found for that is talking to someone who lived through those memories with you. I don’t know if I’ve ever been more glad in my life than when I did that, and it happened in my 60’s. If you can find some of your really close boyhood friends and reconnect, it might do you a world of good. For me, it was a desperately needed application of the Balm of Gilead to a place in my soul that had hurt for many years. I had grown so accustomed to the ache that I had forgotten what it was like not to hurt, so when it started healing I was both overjoyed and intensely grateful to God for a second chance to get it right. May God be with you in this time of drudgery and reconstruction. It will get better; you just have to endure long enough to have the recovery mix sufficiently with the “new normal” to make life feel like living again. Listen to the soundtrack of “Les Miserables.” That will help.